Living in Eugene, it is impossible to escape Duck Pride as Oregon football fandom. Church sermons invoke the Ducks and refer to the team’s hard work and dedication. Grocery store transactions and chats at local cafes or gas stations conclude with “Go Ducks!” Fans wear school colors and jerseys, as well as shirts stating “QUACK ATTACK” and “Come to the Duck Side”. In January, Eugene was buzzing with excitement over the first College Football Playoff National Championship with UO Ducks taking on the Ohio State Buckeyes. On and off campus, there was a constant chatter about the game from both fans and normally disinterested residents. Social media posts and tweets were fast and furious as fans and friends cheered on their team. Trending hashtags included #DucksvsBucks #GoDucks and, after their defeat, #OnceADuckAlwaysADuck. Becoming a duck can be as simple as attending the university, living in Oregon, or being a dedicated booster. Duck mania is everywhere and inescapable here in the land of the webfoot—the old name for an Oregonian. Whether we win or lose, Duck pride is integral to Oregon identity—part of our community folklore. Tell us about your favorite Oregon Football Fandom moments with a comment on our Facebook page! 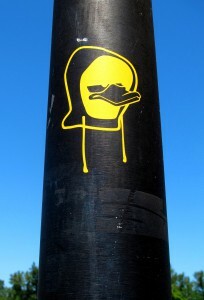 Photo from the University of Oregon Libraries shows the Quack Ops logo seen in town. No longer operating, Quack Ops was a student-run business for “underground apparel for ducks, by ducks,” where fans took their representation into their own hands.